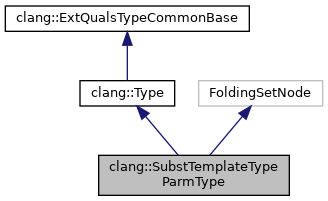 Represents the result of substituting a type for a template type parameter. Within an instantiated template, all template type parameters have been replaced with these. They are used solely to record that a type was originally written as a template type parameter; therefore they are never canonical. Definition at line 4615 of file Type.h. Definition at line 4654 of file Type.h. Definition at line 4641 of file Type.h. Gets the template parameter that was substituted for. Definition at line 4630 of file Type.h. 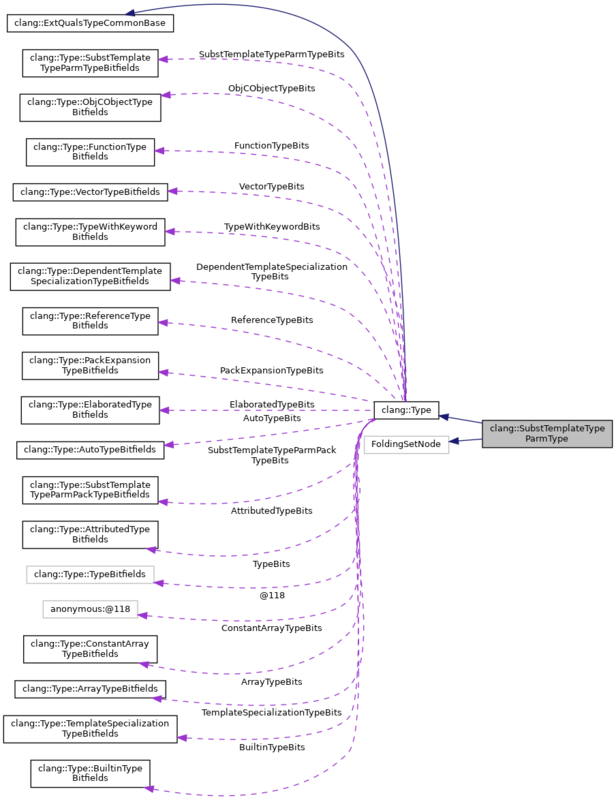 Referenced by clang::TreeTransform< Derived >::TransformExceptionSpec(), clang::ASTNodeTraverser< Derived, NodeDelegateType >::VisitSubstTemplateTypeParmType(), clang::ASTNodeImporter::VisitSubstTemplateTypeParmType(), and clang::ASTTypeWriter::VisitTagType(). Gets the type that was substituted for the template parameter. Definition at line 4636 of file Type.h. Referenced by clang::getParameterABISpelling(), clang::TreeTransform< Derived >::TransformExceptionSpec(), clang::ASTNodeImporter::VisitSubstTemplateTypeParmType(), and clang::ASTTypeWriter::VisitTagType(). Definition at line 4640 of file Type.h. Definition at line 4643 of file Type.h. Definition at line 4647 of file Type.h. Definition at line 4616 of file Type.h.